Colors: G.J. Nikolas & Co., Inc.
G. J. Nikolas and Co., Inc. offers a complete line of pigmented coatings. A variety of colors are available in our conventional and Eco-Borne® product lines. We manufacture opaque, semi-transparent and transparent colors for any type of application. Please see our vehicle selector guide to assist you in your choice of vehicle to match your product requirements. If additional information is required, please contact us and allow our customer service representatives to assist you. 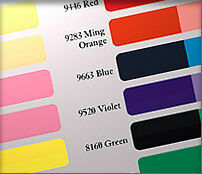 If an exact color is needed, we offer a color matching service for a nominal fee. QuickSilver is a new coating product line that is as easy to use as 1-2-3 and is a brilliant plating substitute. Its appearance will simulate a chrome or polished silver finish. It is also available in a variety of metallic colors and in many vehicle types. It can be applied to any substrate including metal, wood, plastic, and glass. It will give you a near mirror type finish. G.J. Nikolas & Co., Inc. offers a variety of opaque and semi-transparent enamels. These colors are available in a selection of vehicles in both our conventional and Eco-Borne® coating lines. Nikolas Dye Colors are concentrated liquid dyes that can be blended with clear coatings. The result is a transparent colored coating, which fully reveals the surface finish of the base metal. Our toners are transparent or semi-transparent coatings with the color already incorporated into the clear coating. These toners can simulate an oxidized or antique effect of the metal to match other areas or can be used to make the metal appear to be a different metal, such as making nickel appear to be bronze. Metallic pigments that can be incorporated into one of our bronzing liquids to produce a duranodic coating. Also available are our mica pearl finishes. Our duranodic coatings are made with pigment that contains metal flake. These are commonly used to match anodized metals. Nikolas Daylight Colors are pigmented coatings formulated with fluorescent pigments. Crackelac - is a specialty finish in which a coat of contrasting color Crackelac is sprayed over a suitable base coat. Then upon drying the Crackelac shrinks and allows the base color to show through the irregular cracks. This produces an antique effect similar to a cracked varnish found on antique furniture and picture frames. Copper Slurry - is a conductive coating for metallizing non-conductors so that electroplating can be done such as in bronze baby shoes.